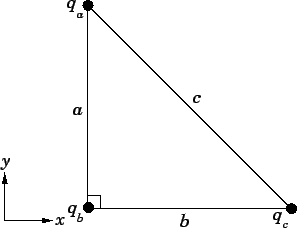 Question: Suppose that three point charges, , , and , are arranged at the vertices of a right-angled triangle, as shown in the diagram. What is the absolute electric potential of the third charge if , , , m, and m? Suppose that the third charge, which is initially at rest, is repelled to infinity by the combined electric field of the other two charges, which are held fixed. What is the final kinetic energy of the third charge?